I’m not sure how it happened (began with a story about Willa Cather on NPR? ), but suddenly my niece and I were in a Facebook conversation about reading Cather’s My Antonia together. A friend joined our Facebook conversation reminding me of her acquaintance with Cather country because her in-laws own a ranch up in the middle of Nebraska. 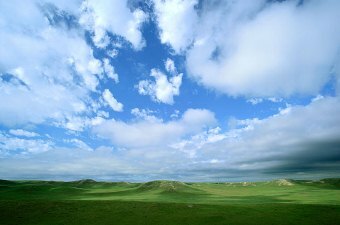 That began a cascade of memory about the Sand Hills of Nebraska. Mari Sandoz. Another Nebraska writer. I have never heard anyone outside Nebraska mention her. My friend mentioned her on Facebook. Sandoz and Cather. The Nebraska women of letters. 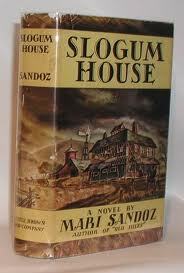 My ninth grade English teacher Miss Eggleston knew Sandoz and taught us Cather. The canyon was wide at the water’s edge, and though it corkscrewed back into the mesa by abrupt turns, it preserved this open, roomy character. It was, indeed a very deep valley with gently sloping sides, rugged and rocky, but well grassed. There was a clear trail. Horses have no sense about making a trail, but you can trust cattle to find the easiest possible path and to take the lowest grades. The bluish rock and the sun-tanned grass, under the unusual purple-gray of the sky, gave the whole valley a very soft color, lavender and pale gold, so that the occasional cedars growing beside the boulders looked black that morning. (1). You’ll have to look a long way before you find prose that is simply right the way Cather’s is. It sounds the way writing is supposed to sound. Read it out loud. Joy in its simple expressiveness. And this is not her best work. It’s the one that’s most intriguing to me. I’ve never figured it out, but that doesn’t matter. It’s a novel within a novel. A “frame” story to end all frame stories. Willa Cather’s prose sounds the way prose is supposed to sound. And I haven’t mentioned Death Comes for the Archbishop. Jim Burden, the narrator of My Ántonia, describes his arrival in Nebraska to live with his grandparents after his parents die. There was nothing but land: not a country at all, but the material out of which countries are made. No, there was nothing but land–slightly undulating, I knew, because often our wheels ground against the brake as we went down into a hollow and lurched up again on the other side. I had the feeling that the world was left behind, that we had got over the edge of it, and were outside man’s jurisdiction. I had never before looked up at the sky when there was not a familiar mountain ridge against it. But this was the complete dome of heaven, all there was of it. . . Between that earth and that sky I felt erased, blotted out. I did not say my prayers that night: here, I felt, what would be would be (2). I grew up “feeling that the world was left behind, that we had got over the edge of it.” I’m not sure how much western Nebraska had to do with that. But western Nebraska can give anyone the impression “that we had got over the edge” of the world. I know Nebraskans who cannot live near mountains—they feel claustrophobic. Even Texas, with its huge areas of nothingness does not have (for me) the sense of expansiveness that almost any part of Nebraska has outside of Omaha or Lincoln. Perhaps it’s not so much that we’ve “got over the edge of the world” as the world has no edge there. 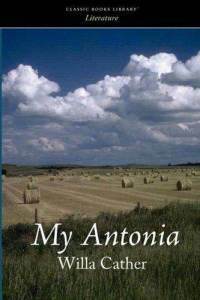 We read My Ántonia in Miss Eggleston’s class because it is quintessentially Nebraska. We all knew someone from Red Cloud (Cather’s home town—whose residents were appalled to find themselves in a novel). The grandparents of one of my best friends were from Red Cloud and knew all of those folks. What we missed when we read the novel as kids was its quintessential truth about life and death (what ninth grader can even imagine death?). I am stunned by the number of websites devoted to the “study” of My Ántonia: Sparks notes, lesson plans from various teachers’ organizations, discussion groups. I wonder if anyone simply reads the story. So I’ll engage in a little “study” myself. The landscape of the Nebraska is Cather’s “canvas.” Later it moves to the desert southwest. Cather did not participate in an art where “landscape was ignored, as though non-existent, waiting to be discovered by later artists.” She had no truck with art in which “landscape [was] a slight, transitory thing, as a strip of green overgrown graves beneath which hung hell and above which the great heavens opened as the actual, deep reality, desired of all Being” (3). Death is the only absolutely certain event – in addition to birth – which every one of us will ultimately share with every other human being. . . yet, [its] significance is particularly difficult to get at since death lies at the very edge of our experience. . . Is death a threshold or is it an abyss. . since even now we are all of us on our way toward death. . . what bearing. . . should [death] have, upon the course and the conduct of life (4).
. . . come to terms with the fact that death involves the whole of me, body and spirit. Death is not a process happening to a part of me, while another part, the “real self,” prepares to escape surreptitiously at the last moment like a butterfly from the cocoon. I myself as embodied spirit, I do the dying. The existential reality of death involves the whole of me moving toward my end (5). thought very little about death; it was the Past he was leaving. The future would take care of itself. But he had an intellectual curiosity about dying; about the changes that took place in a man’s beliefs and scale of values. More and more life seemed to him an experience of the Ego, in no sense the Ego itself. This conviction, he believed, was something apart from his religious life; it was an enlightenment that came to him as a man, a human creature (6). In the life of John Burden and the death of the Archbishop is the knowledge that the world was left behind, that we had got over the edge of it, and were outside man’s jurisdiction. It’s necessary to know the world, all there is of the dome of heaven, to understand that. (1) Cather, Willa. The Professor’s House (1925). New York: Vintage Classics Edition, 1990. (2) Cather, Willa. My Ántonia. New York: Dover, 1994. (3) Kuhlken, Pam Fox. “Hallowed Ground: Landscape as Hagiography in Willa Cather’s Death Comes for the Archbishop.” Christianity & Literature 52.3 (2003): 367-385. (4) Fletcher, Verne H. “Some Reflections on Death.” Theological Review 31.1 (2010): 4-59. (6) Cather, Willa. Death Comes for the Archbishop. New York: Alfred A. Knopf, (reprint edition) 1967. Section 9, part 6.